"Voice mail" is a very useful feature for enterprise or small business users. When the subscriber is out of office or cannot answer the call, the IPPBX can prompt the incoming caller to leave voice messages and the system will send these voice messages to the subscriber's email-box. The subscriber can get and check these messages (mails) when he/she logins to his/her email account. From version 2.5.3, miniSIPServer can support this wonderful feature. Please download miniSIPServer from https://www.myvoipapp.com/download. When the subscriber is unreachable or no-answer, miniSIPServer will prompt the greeting voice to the incoming caller party to leave message. miniSIPServer can mail these voice messages to subscribers' email box. Each local user (extension) can has their personalized greeting voice. Each local user can record their own personalized greeting voice very easily. 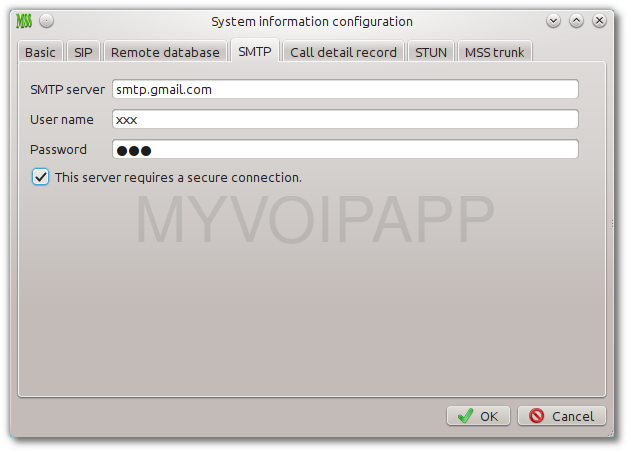 This document will give a detail guide on how to configure "voice mail" feature with miniSIPServer. There are two items need to be configured. First, since the voice messages will be sent to users' email box, the SMTP (Simple Mail Transfer Protocol) server information should be configured. 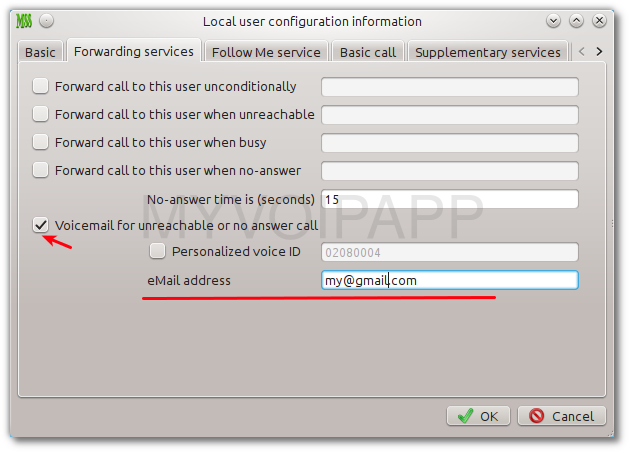 Second, the users should be configured to subscribe "Voice Mail" service and receive voice mails. If the SMTP information hasn't been configured, the users cannot subscribe "Voice Mail" service. SMTP information is system level configuration. Please click menu "Data->System" to edit it. In the pop up window, please select "SMTP" tab like below figure. SMTP server, such as "smtp.gmail.com". The user name which will be used to login into the SMTP server. If the SMTP server doesn't need authorization, this item can be NULL. The password of the user. It is also used to login into the SMTP server. If the SMTP server doesn't need authorization, this item also can be NULL. If the SMTP server requires SSL/TLS connection, this option must be selected. After configure above items, please click "OK" button to enable them in miniSIPServer. Please pay attention that you don't need configure these SMTP items if you are using cloud minisipserver system. The system will use its own SMTP server to send voice-mail for you. In this step, there are also two items should be configured. First, local user should subscribe "voice mail" service. Second, we must indicate/configure the subscribers' email address to receive voice mails. Please click menu "Data->Local users" and add or edit a local user. In the pop up window, please select "Forwarding services" tab. The local user need to subscribe "voice mail" service explicitly. As above, please select "Voicemail for unreachable or no answer call". At the same time, we need configure his/her email address together, his/her voice messages will be sent to this email address. The default greeting voice id is "02080004". Each user can has their own personalized greeting voice. To do this, we can select "Personalized voice ID" item and fill the announcement ID just like above figure described. Of course, please click "OK" button to enable this configuration. We can dial "*61" to hear our greeting voice. In default, miniSIPServer will prompt "Please leave your message" to caller party. We can dial "*60" to record our own personalized greeting voice. When the call is established, miniSIPServer will prompt previous greeting voice, then we can begin to record our new greeting voice. In another way, we can use "sound recorder" tool to record our own greeting voice manually. Please refer to below online document. This document give a detail guide on how to record your own announcement files for miniSIPServer. If the personalized voice ID is "02080100", the WAV file will be "02080100.wav" and stored in the "ann" sub-directory. According to above descriptions, we can see that MSS will send the voice messages to the local users' email address by default. So it is unnecessary for MSS to indicate the users how many voice messages have been recorded and MSS will not store voice messages. But in some deployments, the customers' SIP phone can support MWI and they hope MSS can store the voice messages and indicate the local users how many voice messages have been stored, and the local users can dial into MSS to check or hear their voice messages through SIP phones. This is a tranditional telephones network feature. Of course, it is conflicted with "sending voice messages to email address". So MSS uses a variant to control which mode should be deployed. By the way, MSS V3.1 build 20110425 or above versions can support this mode. If "gVarScpVmsMode" is set to be 1, MSS will store local users' voice messages in the server and indicate the users how many messages have been stored. 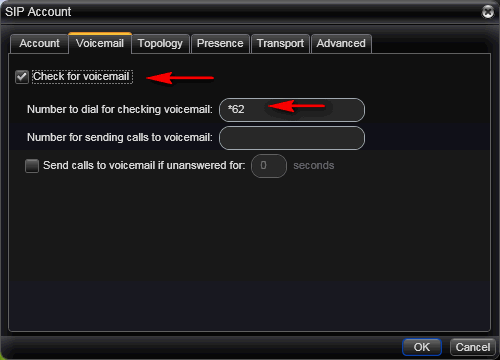 By default, local users can dial "*62" to check or hear their voice messages. If the users have voice messages, MSS will prompt them to the users one by one. During the promption, users can press 0 to delete the message or press 1 to go to next message. 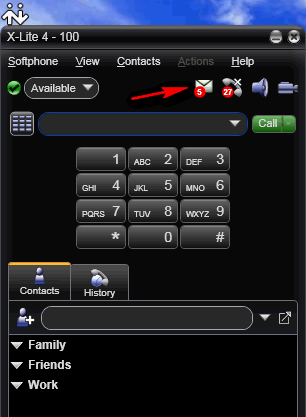 X-lite4 can support MWI feature and it can display the number of voice messages in the GUI. In below figure, there are 5 voice messages have been recorded and stored in the MSS. Users can click the "messages waiting" icon to check and hear the voice messages. Because the local users "voice mail" features have been configured in MSS, it is unnecessary to configure "sending calls to voice mail" and "no-answer" value in Xlite.